G2 Esports has returned to the Call of Duty scene. Roughly 24 hours before the start of MLG Atlanta, G2 Esports surprised the Call of Duty community by announcing their return with the acquisition of a North American roster. 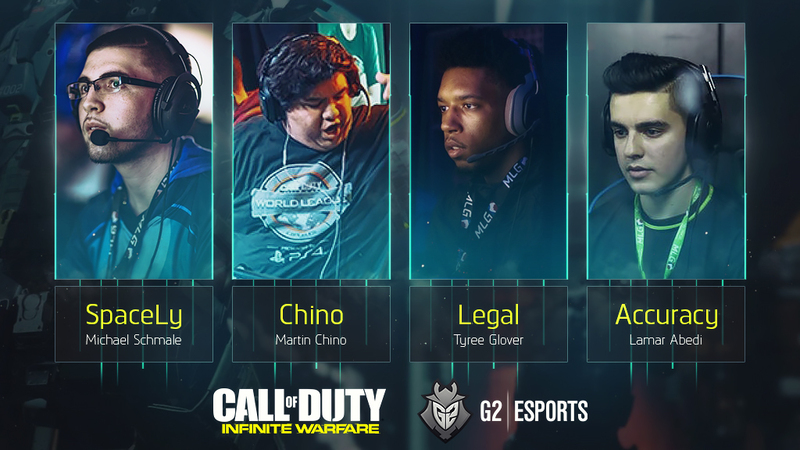 The new G2 roster will consist of Martin “Chino” Chino, Michael “SpaceLy” Schmale, Tyree “Legal” Glover and Lamar “Accuracy” Abedi. In their announcement, G2 stated that they made a promise to return to Call of Duty when they released their last roster in 2015. This team has been practicing together for a little under two months, forming this roster after each player had disappointing results at MLG Vegas. Accuracy and Legal most recently played for eUnited, placing top-24 at Vegas, while Chino and SpaceLy earned top-28 finishes at Vegas with Renegades and Trigger Happy respectively. With this roster, G2 has a great chance of succeeding in the open bracket at Atlanta and earning one of the final four spots in pool play. What are your thoughts on G2’s new roster? Let us know by tweeting us @GAMURScom.